Late in 1795, the Draped Bust dollar design by Robert Scot replaced his former Flowing Hair motif that became the first design on any official United States silver dollar. The Draped Bust design, like the Flowing Hair type, represents a visage of Miss Liberty. In the Draped Bust design, Scot chooses a more matronly appearance for Miss Liberty. Both the Flowing Hair and Draped Bust dollars depict rightward-facing portraits of Miss Liberty, though in the later design the image captures the female likeness from a vantage point that shows her breast line, which is draped by a gown. 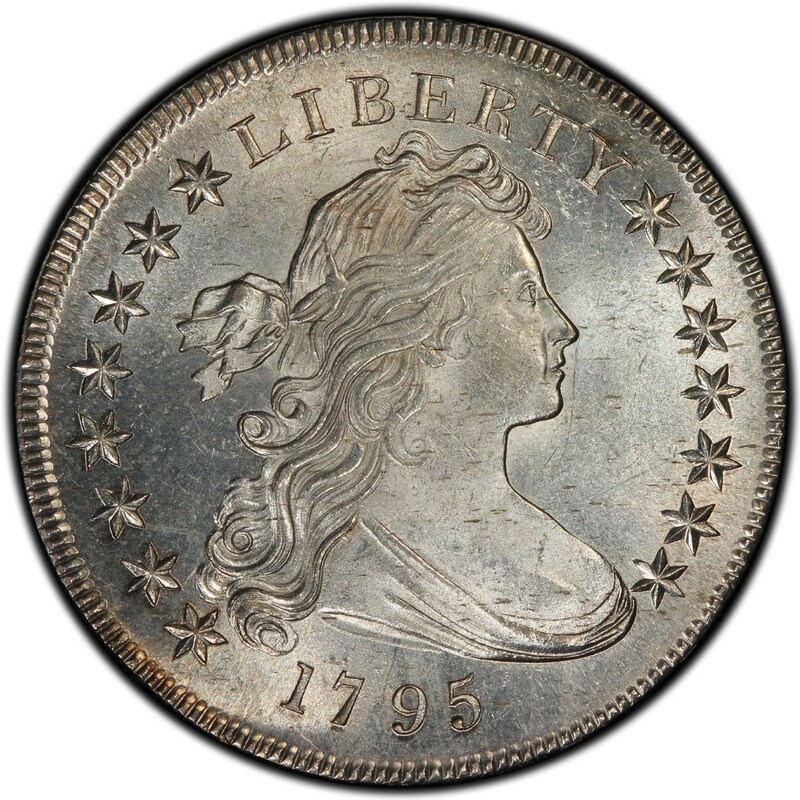 While the 1795 Draped Bust dollar depicts a significantly different version of Miss Liberty than is seen on the obverse of the Flowing Hair dollar, the eagle on the reverse both silver dollar types is vastly similar. 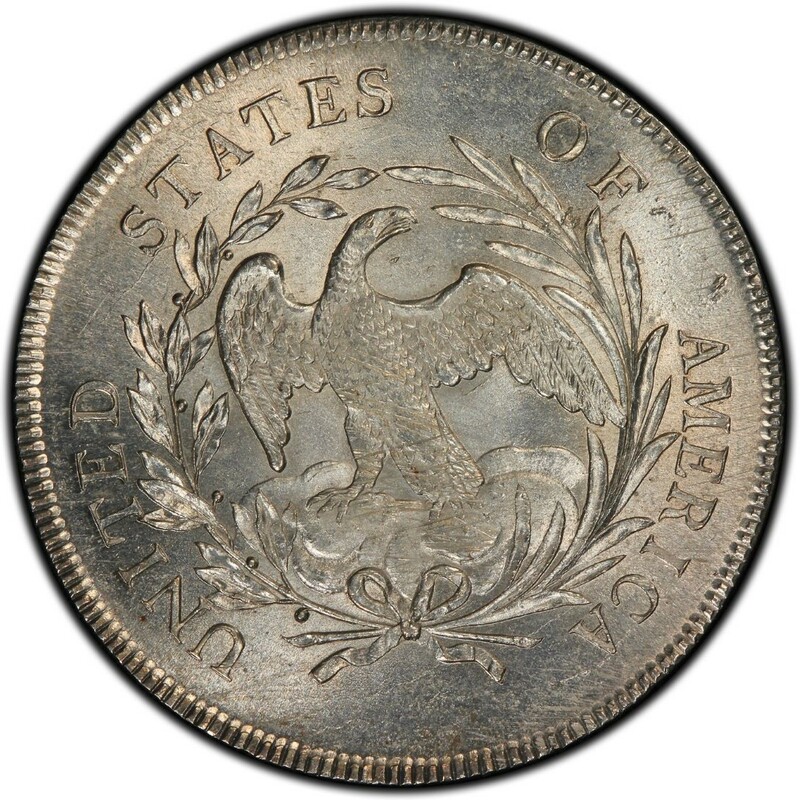 However, in numismatic nomenclature, coin collectors refer to the eagle on the reverse of the 1795 dollar as a “small eagle.” This is not a distinction of eagle sizes among 1795 dollars, but rather distinguishes the eagle design on the 1795 dollar from the larger, heraldic eagle that first appeared on Draped Bust dollars midway through 1798. On that note, there are several noted 1795 Draped Bust dollar varieties that were created as a result of the hand-processed striking, various dies and die repairs, and relatively short dollar die lives of the period. The most popular varieties that collectors encounter in price guides and catalogs are the 1795 Centered Bust and 1795 Uncentered Bust dollars. Both are roughly equal in price across most grading thresholds, but nevertheless represent different collecting opportunities for hobbyists. The 1795 Draped Bust dollar is, like all early American dollars, a relatively scarce coin. Draped Bust dollars saw a small mintage of just 42,738 pieces in 1795 and only a fraction of these, perhaps as few as 4,000, survive today in any grade. Most of these exhibit some type of problematic collector issue, such as signs of a past cleaning, holes, or other damage. Most 1795 Draped Bust dollars range in price from about $1,500 for a Good-4 specimen up to more than $10,000 for examples grading better than Extremely Fine-40. Uncirculated 1795 dollars are exceedingly scarce and are generally worth $55,000 to $60,000 or more. I have a 1795 Draped Bust Silver Dollar.